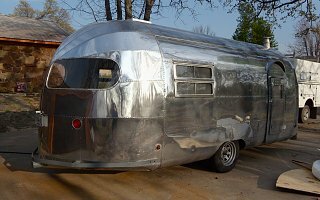 Another uncanny Airstream find… today I stumbled upon a 1946 Curtiss Wright parked in the street in a neighbouring suburb (similar to the photo above). I’m not sure what compelled me to drive to this street, but I was pretty excited by my find. Okay, so it’s not technically an Airstream, but these are rarer than hen’s teeth here in Australia. And she was being pulled by a pretty fabulous purple VW! Unfortunately, it was a 38 degree day and the kids were melting in the back of the car (one fast asleep) so I couldn’t stop for a proper look. I went back tonight and left a note for her owner – fingers crossed they get back to me. I really hope they don’t think I’m a stalker.